Son of Zacharias and Elizabeth, being of priestly descent through both parents. This lineage was essential, since John was the embodiment of the law of Moses, designed to prepare the way for the Messiah and make ready a people to receive Him. He was the outstanding bearer of the Aaronic Priesthood in all history and was entrusted with its most noble mission. His forthcoming birth and the nature of his ministry were announced to John’s father by the angel Gabriel (Luke 1:5–25). He was a child of promise, with prophecies of his mission having been given by Isaiah (Isa. 40:3) and Malachi (Mal. 3:1; see also 1 Ne. 10:7–10; 2 Ne. 31:4–8). He grew up in the desert until the time arrived for his ministry to prepare the way for the Savior. The sign of the dove, as an emblem for the Holy Ghost, was a pre-appointed signal by which John knew he was to recognize that he had baptized the Son of God (see John 1:29–34). At the time of the baptism of Jesus, John saw the sign and heard the voice of the Father bearing record that Jesus was the Beloved Son, in whom the Father was well pleased (Matt. 3:13–17). He had preached and baptized for several months before he baptized the Savior and continued to do so afterwards for several months (John 3:23–24). At least two of those who were later to become members of the Twelve, John and Andrew, were disciples of John before they met Jesus (John 1:35–42). It is probable that others of the Twelve were also tutored by him (Acts 1:21–22). He watched, without feelings of jealousy, the waning of his own influence and the growth of the influence of Jesus (John 3:25–36). He was shut up in prison by order of Herod for criticizing Herod’s unlawful marriage of Herodias (Mark 6:16–29). While in prison, John sent two of his disciples to inquire of Jesus to reassure their faith. Many have thought this event reflected a lack of confidence in John’s own mind. However, Jesus took the occasion to bear testimony of the great work John had done, emphasizing that he was unwavering and true (see Luke 7:24–28). Jesus also pointed out that John had fulfilled the prophecy of Mal. 3:1. Jesus praised John as a prophet, saying there is none who was greater (Matt. 11:7–11). This greatness consisted of his unique privileges and the quality of his work. He alone was entrusted with the mission of preparing the way and baptizing the Savior of the world. He “did no miracle” (John 10:41) but magnificently fulfilled his assignment in bearing testimony of Jesus Christ. Jesus characterized John as “a burning and a shining light” (John 5:35). After nearly a year in prison, John was beheaded at the instigation of Herodias (Matt. 14:3–12; Mark 6:17). A vigorous preacher, John taught many principles and doctrines of the gospel and filled his mission in every particular. Latter-day revelation confirms the biblical account and also makes known additional events in the ministry of John. We learn that he was “ordained by an angel,” when he was eight days of age, to overthrow the kingdom of the Jews and to prepare a people for the Lord. 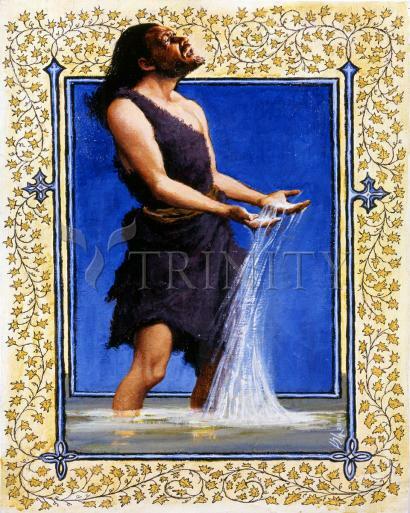 We learn also that he was baptized while yet in his childhood (D&C 84:27–28). On May 15, 1829, this same John came to Joseph Smith and Oliver Cowdery near Harmony, Pennsylvania, and ordained these men to the Priesthood of Aaron (D&C 13; 27:7–8; JS—H 1:68–72). Thus his ministry has operated in three dispensations: he was the last of the prophets under the law of Moses, he was the first of the New Testament prophets, and he brought the Aaronic Priesthood to the dispensation of the fullness of times.